The Anna Catherina Islamic Complex (ACIC) Computer School was officially re-launched on Friday last at an impressive ceremony attended by US Ambassador Mr. D. Brent Hardt, Member of Parliament Mr. Manzoor Nadir, Regional Chairman Region, Julius Feaber. 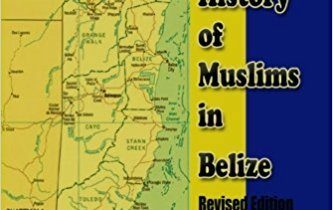 The school was established in 2005 under a grant from international charity organization, Muslim Aid of London, England, was then said to be the first such school to be established by the Muslim community in Guyana. 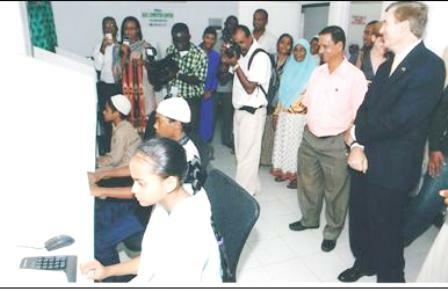 The re-launch of the Centre was made possible through the donation of state of the art computers donated by the US Embassy, Georgetown. US Ambassador to Guyana, HE Mr. D. Brent Hardt, stated that the objective of the US Embassy is “.. to not only provide computers, but to provide a safe place for the community to come together”. He alluded to the new set of challenges and opportunities in this 21st century but that these challenges requires using 21st century tools. The donation of the computers, he stated, is part of the United States of America’s effort to empower communities and people for development by enhancing their connection to the 21st century technology. Ambassador Hardt stated his pleasure that even though the center is located at an Islamic institution, it will be accessible and available to persons of all religious, ethnic and cultural background. He commended the Guyanese people for the way they peacefully co-exist in a multi-faith society. Mr. Shabir Hussain thanked the US Embassy for the donation which will now allow for the re-launch of the center to better serve the community. The Computer Centre will be operated by a fully professional and qualified staff. Also speaking at the program was Member of Parliament, Mr. Manzoor Nadir who pointed out the Government of Guyana’s major thrust to provide technology to its people especially through the One Laptop Per family Program (OLPF). Regional Chairman Julius Feaber welcomed the Center’s relaunch in his Region, stating that Region 3 is now richer with the Computer center. American scholar visited the region on fact finding tour. Be the first to comment on "US Ambassador to Guyana donates computers"